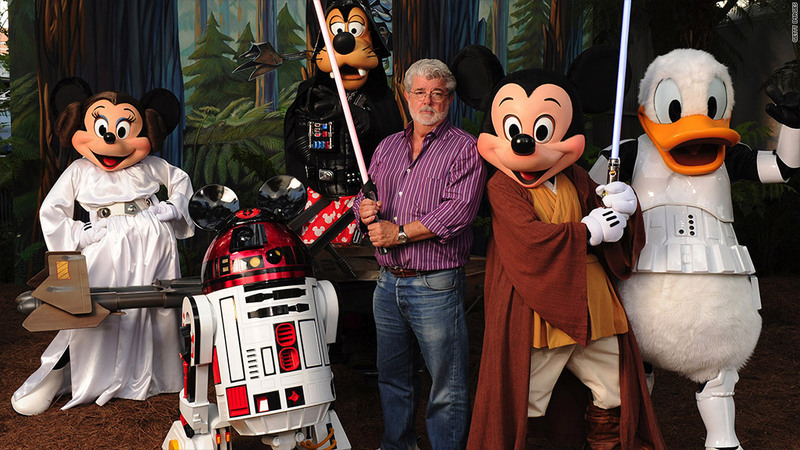 Lucasfilm founder George Lucas, creator of Star Wars, is selling his company to Disney for $4 billion. The takeover will give Disney (DIS) control of Lucasfilm's blockbuster Star Wars franchise, which encompasses both filmed productions and a massive merchandising operation. Disney will also absorb Lucasfilm's special-effects production business, Industrial Light and Magic, and its Skywalker Sound audio production studio. Lucas said he will work as a creative consultant on Star Wars Episode 7, the first of a planned new trilogy of live-action Star Wars movies. It is targeted for release in 2015, Disney said. "The film is in what I'll call early-stage development right now," Disney CEO Bob Iger said on a conference call with analysts. Lucas did not join him on the call. Disney hopes to essentially relaunch the Star Wars film franchise, which had its last installment in 2005 with Revenge of the Sith. Following the three planned sequels, the company envisions releasing even more Star Wars movies at a rate of a new film every two to three years. Future movies may not be sequels but movies that focus on fringe characters. Disney also believes there is potential for a television series. "Disney respects and understands -- perhaps better than anyone else -- the importance of iconic characters," Iger said. Disney's Lucasfilm purchase is the culmination of transition plans Lucas began forming several years ago as he "began contemplating a form of retirement," Iger said. "He and I started talking about a year and half ago but only decided pretty recently that this is something we both wanted to do." Disney executives repeatedly drew parallels between the Lucasfilm deal and the company's 2009 acquisition of Marvel Entertainment, which also cost $4 billion. Both studios operate entertainment franchises that can support a steady series of tentpole movies and fuel ancillary merchandising, theme park and other revenue streams, executives said. They also cited the past precedent of Pixar, which Disney purchased in 2006. Apple (AAPL) co-founder Steve Jobs, Pixar's creator, became Disney's largest shareholder, with a stake that dwarfs Lucas' planned share. Steve Jobs' family trust now controls his nearly 8% share of the company. In valuing Lucasfilm, Disney focused almost entirely on the Star Wars franchise, company executives said. "We didn't ascribe any value to the Indiana Jones franchise because of the encumbrances that exist," Iger said, referring to Paramount Pictures' ongoing stake in the series it has distributed. News Corp. (NWS) unit 20th Century Fox has been Star Wars' distributor until now. It retains some rights to past films but has no stake in Disney's planned future installments, company executives said. Kathleen Kennedy, current co-chairman of Lucasfilm, will become president of Lucasfilm, reporting to Walt Disney Studios Chairman Alan Horn. Lucasfilm employees will remain based at the company's San Francisco headquarters. How active will Lucas be involved in shaping future Star Wars films? Iger's answer to that question: "It's his intent to retire." That will come as a relief to some of the fans who flocked to sites like Twitter, where #DisneyStarWars quickly became a trending topic. One analyst on Disney's conference call shared their mixed emotions. "I can say, Bob, that you're risking the wrath of the entire Internet," he told Iger. "But, I dunno, I'm excited."